Time for a cuppa. 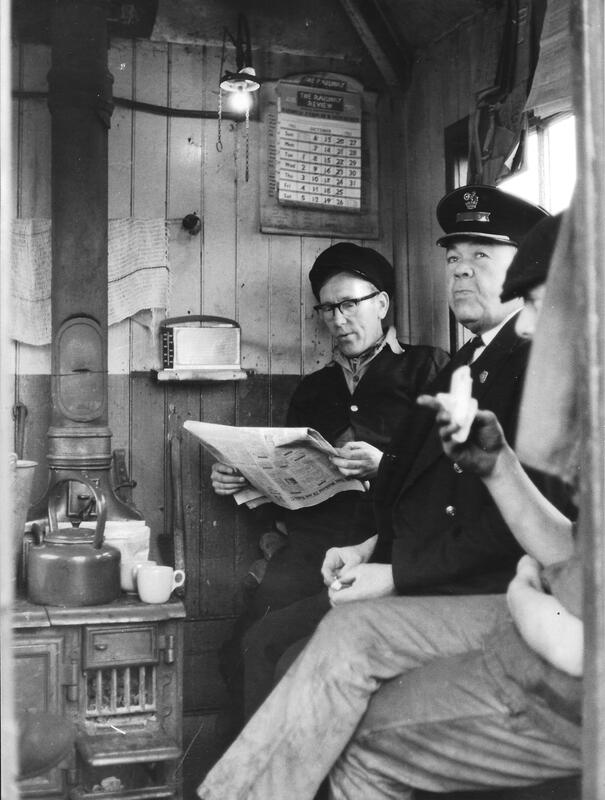 Left to right; Relief Signalman Herbert Brook, Guard George Tustrall and Fireman Dave Pallett. I think this is actually the original signal cabin, which stood at the end of the platform until 1900, beyond the water tank and coaling stage. Apart from replacement windows facing the station building it is identical to the cabin at Langstone and to those on early photos of the LB&SCR stations at West Grinstead and Rudgwick. It probably dates from soon after 1872, when the LB&SCR assumed responsibility for operating the branch. It cannot be seen in the photos of the early 1900s and I suspect it stood between the bay platform and the bounday fence, as the 1910 map shows a square structure,half way to the station building. Does anyone know when it was moved to its final position beside the bay starting signal? I am going to Bluebell Railway archive 15th April and will see if I can get some more information during the visit.